Updated Sunday May 6, 2018 by SLL. USA Baseball today decertified the 30/20 Easton Ghost X bat. The 30-inch, drop 10 Ghost X is no longer an approved bat for use in Little League under the new USA Bat Standard. Please know that this announcement only applies to the 30 inch, drop 10 Ghost X model, according to Little League International. All other certified lengths and drops of the Easton Ghost X USA Bat remain approved for play. No reason has been provided thus far for the decertification. Please know that this decision was not made by Smithfield Little League, rather USA Baseball. If you purchased the bat, please read a press release issued by Easton at the end of this message that includes information with regard to a $500 voucher. Umpires have been informed of this announcement and will check bats during Saturday’s and future games to ensure that teams are in compliance with this new bat regulation. For more information, click here. The following is a press release issued late Thursday night by Easton. 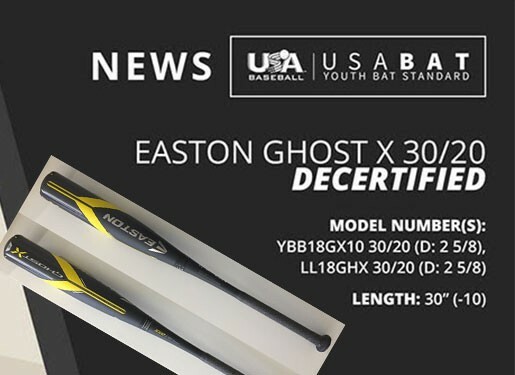 Thousand Oaks, Calif. (May 3, 2018) – Easton regrets to inform you that the Easton Ghost X, 30” -10 USA Baseball bat (model #’s YBB18GX10 30/20 & LL18GHX 30/20 Japan model) is no longer certified or approved by USA Baseball. Easton acknowledges full responsibility for this situation, and we seek to resolve this issue as quickly as possible. Please visit our website, http://news.easton.com/ to learn more about our efforts to deal with this decertification and your rights as a consumer. If you purchased one of these bats, you can return it to us. We will provide you a mailing label that you can use to return your bat to us, at our cost. Upon receiving your bat, we will send you a $500 electronic voucher that you may use on easton.com. You may use this voucher to purchase another bat, or any other Easton products available at easton.com, with free shipping. To return your bat and receive your voucher, please call us at 1-844-531-7079, or email us at ghostreturn@easton.com. If you decide to keep your bat to use for other non-USA Baseball leagues, we are required to send you a permanent, non-removable sticker that you can use to cover the USA Baseball certification stamp. Please contact Easton at 1-844-531-7079, or email us at ghostreturn@easton.com, and we will send you this sticker with instructions on how to apply it.